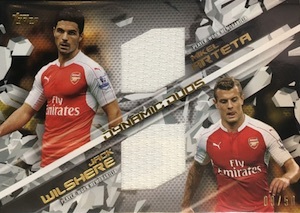 2015 Topps Premier Gold continues the high-end soccer brand for the 2015-16 Premier League season. Hobby boxes utilize a mini-box format, with five cards per mini-box and ten mini-boxes per display box. Each display box promises ten total hits, including five autographs or autographed relics and five relic cards. 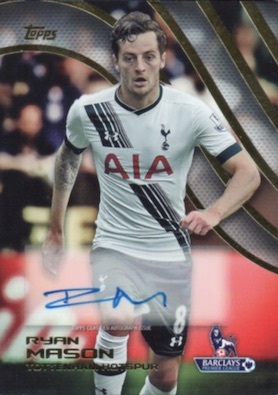 Like previous editions, 2015 Topps Premier Gold Soccer includes the current stars of the Premier League. The 150-card base set features Purple (#'d), Black (#/25), Orange (#/11) and Premier Gold (1/1) parallels. The same parallel options are also available in the two insert sets. All-Time Accolades honor the players who totaled the most goals, appearances, clean sheets for the league and the greatest goals. New Signings document the recent transfers during the off-season. 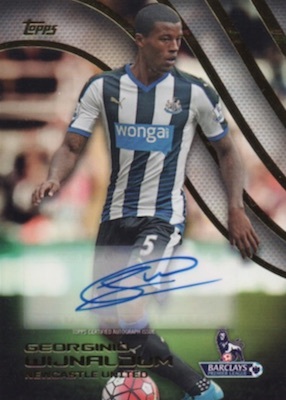 Premier Autographs are the primary signed set and promise a mix of current stars, future greats and former icons. Purple (#'d), Black (#/25), Orange (#/11), Premier Gold (1/1) and Gold Framed (1/1) parallels add a tougher chase element. There are also Premier Jumbo Autograph Relics that include an oversized jersey piece along with a signature. 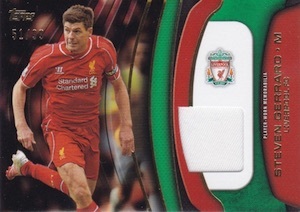 Several parallels, including Orange (#/11), Premier Gold (1/1) and Printing Plates (1/1), add a multi-color jersey piece. The remaining 2015 Topps Premier Gold cards are among the rarest in the product. 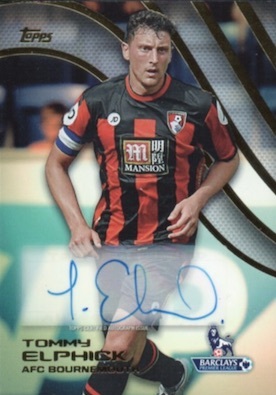 Golden Boot Die-Cut Autographs are a case hit and highlight the top scorers in the league. 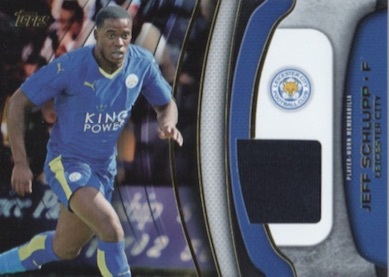 Pure Class Dual Book Cards pair some of the top players in the Premier League with sticker autographs. 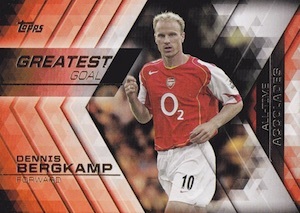 Both autograph sets have a one-of-one Premier Gold parallel. 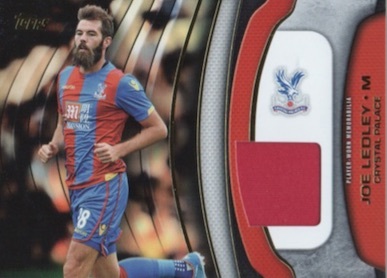 Another case hit, Best of Premier League cards feature an ornate design and metal frame. Silver is the base color and there are also Black (#'d), Orange (#/11), Premier Gold (1/1) and Gold Framed (1/1) parallels, as well as Printing Plates (1/1). PARALLEL CARDS: Green, Purple #/50, Black #/25, Orange #/11, Premier Gold 1/1, Printing Plates 1/1. PARALLEL CARDS: Purple #/99, Black #/25, Orange #/11, Premier Gold 1/1, Gold Framed 1/1, Printing Plates 1/1. PARALLEL CARDS: Black #/25, Orange #/11, Premier Gold Prime 1/1, Printing Plates 1/1. PARALLEL CARDS: Purple #/50, Black #/25, Orange #/11, Premier Gold 1/1, Printing Plates 1/1. PARALLEL CARDS: Purple #/50, Silver Framed #/40 (1 per case), Black #/25, Orange #/11, Premier Gold 1/1, Gold Framed 1/1, Printing Plates 1/1. PARALLEL CARDS: Green #/99, Purple Jumbo #'d, Black Jumbo #/25, Orange Jumbo #/11, Premier Gold Jumbo 1/1, Printing Plates Jumbo 1/1. 11 cards. Serial Numbered #/83 or less. 20 cards. Limited to 20 copies per subject. 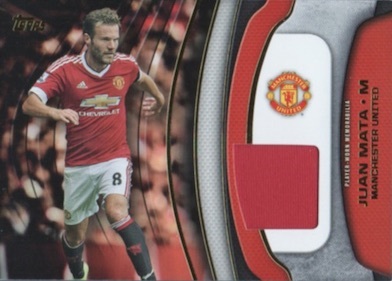 Good: Ten hits per box, Wayne Rooney & Eden Hazard autographs, no redemptions. Bad: Base relics are boring, autograph checklist is fairly week, little growth in product. 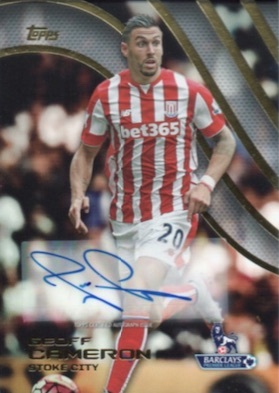 The Bottom Line: The problem with 2015-16 Topps Premier Gold Soccer is that it has shown no real evolution. Sure, ten hits per box is not a bad thing, but that relies heavily on small relics and an autograph lineup that is average, at best. 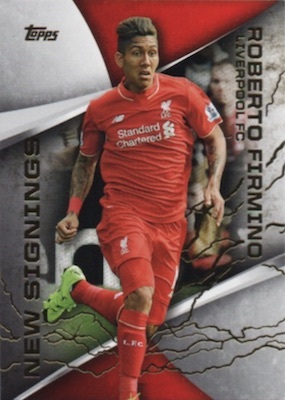 The 2015-16 Topps Premier Gold Soccer design is okay. It still does not seem to match up to a $175-200 box of cards, but there is a level of quality. Having said that, the primary base design is largely disappointing to me. The Premier League has huge franchises and historic venues. However, all you get from the design is a blurred background and wavy lines. I am glad they decided to include the full names this year as opposed to only the last names like last year, but it is a pet peeve that they continue to stick with the vertical text up the side of the card. Relics are a huge focus of Premier Gold and that is not a great thing. Every box includes five of these cards and, for most, this means five of the exact same, single-color relics that are roughly the size of a penny. Even more disappointing is the fact that there are only 18 different cards to pull so the options are limited. 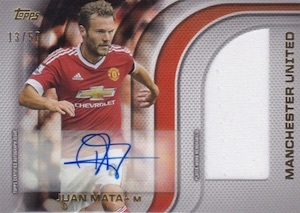 Overlooking the typical sticker autograph format, the signed cards feature a better design and I wish this had been used for the base cards. Beyond this are the rarest hits and the basic inserts. New Signings are just a carryover from last year and joined by All-Time Accolades. 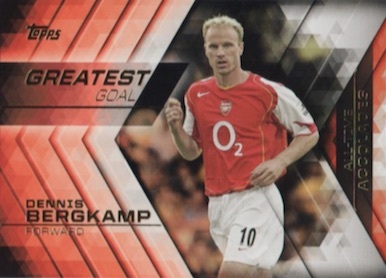 Both featuring a horizontal layout, Accolades opts for a design that covers the entire card except the player image. 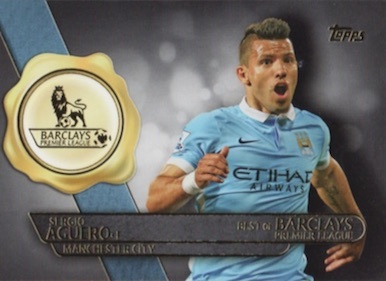 Best of Barclays is visually more appealing with the faux wax seal. Taking things up a notch, the framed versions are pretty cool but are a case hit. 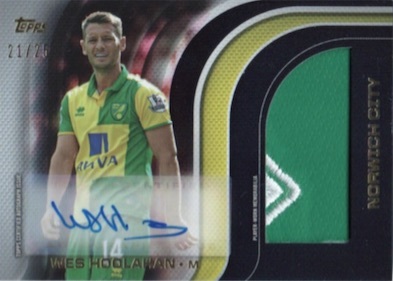 The biggest issue for 2015-16 Topps Premier Gold Soccer is the checklist. 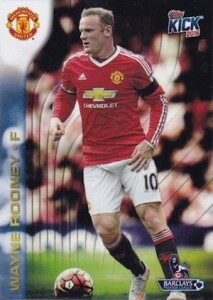 Rooney helps as does Eden Hazard but, outside of them, few of the new additions draw attention. Also hurting things, the variety of teams reflected in the autograph or relic checklist is very limited. Largely centered around just a few of the major clubs (Manchester United, Chelsea, Arsenal) and the newly-promoted teams, it is a very one-dimensional release. Without a good mix and several high-end names, this won’t ever be more than a footnote to collectors. 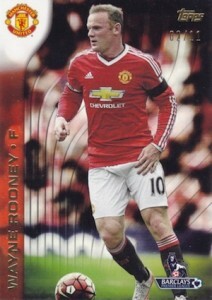 Panini has done well incorporating huge global names into their recent releases and Topps should follow suit. Without a strong checklist to justify the cost, the value is never going to come close. The ten hits are just a mirage once you remove the five relics. It all falls on the five sticker autographs and unless you pull a few of the bigger names or hit a low-numbered parallel, odds are not good to see the value returned. It may surprise some, but the Kick inserts are actually a huge value boost. 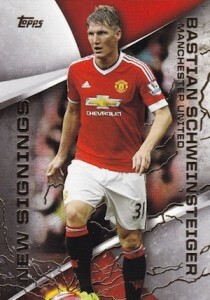 Because there are only 20 of each player, they are very tough to hit, but have produced tremendous prices. The base and insert parallels also help. 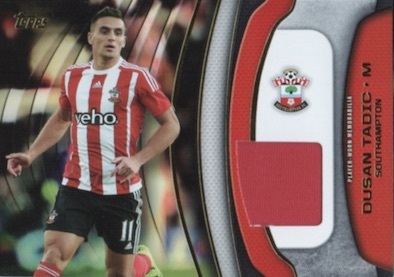 I still found 2015-16 Topps Premier Gold Soccer fun but it does start to drain on me to watch how little growth the product displays. They really need to recapture the excitement of the debut and the only way to do that is make a concerted effort to greatly enhance the checklist. 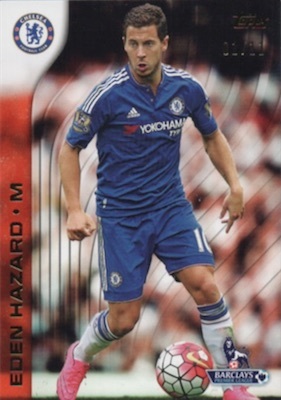 When will Topps figure out that there is no demand for “high-end” soccer products? Like last year, the design is good, but at that price, nobody will be buying…. 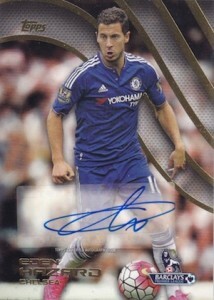 Not bad, but when will Topps realize that not everyone is an Arsenal, Manchester United, and Chelsea fan. I agree with Regular post. Not much auto-fabric wise unless you like those teams. Definitely no Harry Kane love as Tottenham’s rep.